Chaplains spend a lot of time with ICU patients and their families, but we know little about the care we provide or its impact on important patient/family outcomes. One very important outcome for families whose loved ones die in the ICU is their experience of how decisions to discontinue life support technologies were made. This study provides important information both about the care chaplains provided and its impact on family satisfaction, especially satisfaction with decision-making in the ICU. Key features of the study: surveys of chaplain spiritual care in the ICU and of family satisfaction with ICU decision-making and care. 1. 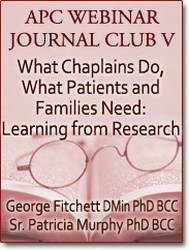 Introduce chaplains to evidence about the prevalence of distress among family members whose loved ones die in an ICU after a decision to discontinue life support technologies. 2. To introduce chaplains to information about the kind and amount of spiritual care chaplains provided in the ICU. 3. To introduce chaplains to evidence that spiritual care provided by chaplains was associated with greater family satisfaction with ICU decision-making and care. Reading: Johnson JR et al. (2014) The association of spiritual care providers' activities with family members' satisfaction with care after a death in the ICU. Critical Care Medicine, 42, pp. 1991-2000. Format: APC-sponsored course, presented as five bi-monthly 60-minute webinar sessions, starting in September 2015 and concluding in May 2016. Participants may register for one, several or all five sessions. Copies of each research article will be made available to those who register for these webinars. For each session, an author of the study will join us to respond to questions from the webinar presenters and participants. Continuity: While there is a common theme for all the articles in the series, each session will be complete in itself, so participants may register for one, several, or all five sessions. Preparation: The articles selected for the series will be available prior to the webinar sessions and participants are strongly encouraged to read them, and complete their own summary reviews of the studies, in preparation for the webinar. A form will be provided to help participants create their own summary reviews.